Buy perfumes for Men wholesale at lowest price. Order perfumes for men at lowest price and stack up more profit. We carry good quality perfumes for men that has been one of the bestsellers at convenience stores and perfume stores. Minimum quantity for "Exotic Body Perfume for Men 3.4 oz 1 PC" is 1. Minimum quantity for "Gold Bullion Perfume for Men 3.4 oz 1 PC" is 1. Minimum quantity for "Artisan Mode Perfume for Men 3.4 oz 1 PC" is 1. 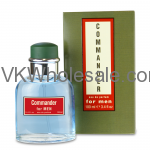 Minimum quantity for "Commander in Chief Perfume for Men 3.4 oz 1 PC" is 1. Minimum quantity for "David & Gabriel Perfume for Men 3.4 oz 1 PC" is 1. Minimum quantity for "Green Basics Perfume for Men 3.4 oz 1 PC" is 1. Minimum quantity for "Infinity Perfume for Men 3.4 oz 1 PC" is 1. Minimum quantity for "QK1 Perfume for Men 3.4 oz 1 PC" is 1. Minimum quantity for "Hilman Perfume for Men 3.4 oz 1 PC" is 1. Minimum quantity for "Academy C Perfume for Men 3.4 oz 1 PC" is 1. Minimum quantity for "Desire & Glamour Perfume for Men 3.4 oz 1 PC" is 1.